Cullors, currently a 2019 MFA candidate at the University of Southern California, has been flexing her creative muscles since before she came to international prominence as the co-creator of the “Black Lives Matter” movement. Yet her art and her work are inextricably intertwined. In fact, her most recent documentary performance piece, Power: From the Mouths of the Occupied, which Cullors directed and produced, was conceived after the 2014 police shooting death of 18-year-old Michael Brown in Ferguson, Mo. With that heavy on her mind, as an artist-in-residence at the Arcus Center for Social Justice and Leadership at Kalamazoo College, Cullors says she wanted to do something on (and for) survivors of state savagery. Power focuses on the unseen and unheard experiences of those in the black community facing criminalization and state violence on an everyday basis. So far, Power has been performed in five cities: Kalamazoo, Mich.; Los Angeles; Dennison, Ohio; Seattle; and most recently, New York City. Power uses real survivors of police encounters who simply tell their stories in their own words. The New York City performance was an abridged version starring Thandiwe Abdullah, Marcel Baugh, and Donnay Edmund and included a multigenerational after-talk with actress Yara Shahidi and freedom fighter Angela Davis. From left: Yara Shahidi, Donnay Edmund, Patrisse Cullors, Marcel Baugh, Thandiwe Abdullah and Angela Davis at Joe’s Pub, New York. For New York’s performance (each city features different stories from different survivors, many local), the two women and man recounted harrowing, mundane, everyday violence that each had experienced, through sometimes poetic, sometimes hard-to-hear words. Edmund’s story was especially difficult as she spoke of a SWAT team coming into her home to look for drugs allegedly in possession of her brother, and police put her cancer-stricken grandmother in cuffs as she, her mother, and her pregnant sister-in-law looked on, helpless. Cullors says she realized that many survivors minimized the impact state violence had on our communities, and on themselves; in fact, for most, it was the first time they’d told their story publicly. “For a lot of performers, this is the first time they’ve shared their story, it was the first time they’ve identified [what happened to them] as state violence,” says Cullors, who also notes that many survivors carry a lot of shame about what happened to them, as if it were somehow their fault. In choosing the various performers, Cullors said she wanted to be conscious of how state violence lay at the intersections of identities. Those who experienced the very heavy New York performance were also treated to an amazing conversation immediately after—three black women, three generations of freedom fighters: Cullors, Angela Davis and actress Yara Shahidi. “Obviously, Angela is a living legend and she’s an icon at this point … but she really has set a tone about what’s possible around fighting, and the longevity of being an organizer and activist. So we get to hear from a woman who’s been in this for several decades and has had her own experiences with state violence and survived it,” says Cullors. With a new presidential election looming, I ask Cullors how she’s feeling about this political season. 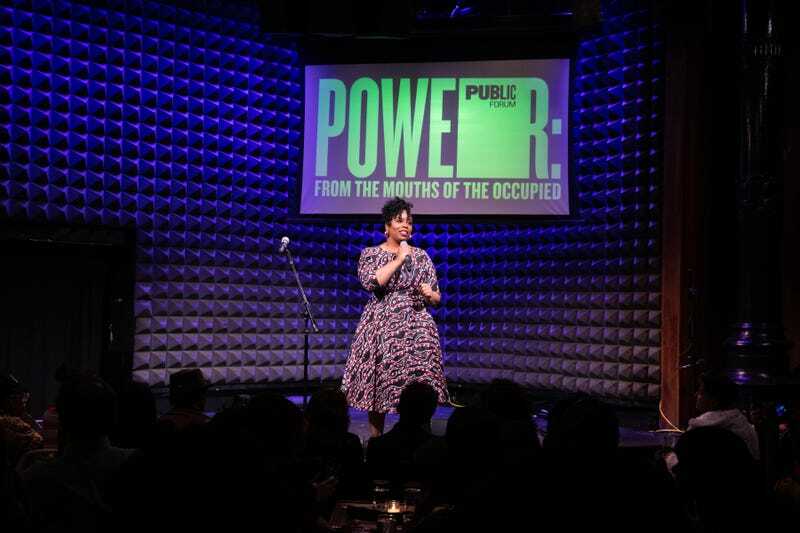 Watch the entire New York City production of Power: From the Mouths of the Occupied below. When Black Lives Are Under Attack, What Do We Do? Stand Up, Fight Back!